Feedback: 40 comments - leave yours! A TV crew from Tokyo Broadcasting System, one of the largest TV channels in Japan, came to film me for 4 days for George Tokoro's World Delivery, a Sunday afternoon world food show. On a Friday afternoon my phone rang and rang and rang and finally I was able to pickup, hearing a faint female voice speaking in English with a fair bit of Japanese accent. She was looking for some guy named "Fekshwin". I said "Sorry Mam but I don't know anybody named Fekshwin, sorry I can't help.". But she insisted. "Are you Francois by any chance? ", she asked. "The Francois from Fekhscuizin?". Ah, right. FXcuisine, not Fekshwin. Yes I am. "We are Japanese TV and read your articles about cheese and were captivated by how passionate you are. We want to come and film you in your kitchen." Her level of English just had improved to perfection. This is a short preview, full video at the bottom of the page. We read your articles, and we’re very touched by your deep love to artisan cheeses and the recipes of your web site FXcuisine.com are simply outstanding! Therefore, we want to introduce your knowledge and love of cheese to Japanese viewers! It so happens that a couple years earlier I had filmed lots of footage with a hope to make a short documentary about Swiss food, including tons of never-seen before things about Swiss cheese of all kinds. This is the reason I was too taken to continue blogging at the same time. Alas the project never left the cutting room. But I was able to propose the Japanese producers lots of options, with pictures of what it would like and organize 4 days of shooting in a few hours. I think they contacted me because of this article - one of my most popular ever. It obviously was rather attractive to the Japanese TV company to have me as a kind of überfixer who knows exactly what they want and what is possible to film where and when. We exchanged tons of emails every day to discuss each recipe they wanted to film and where. Fortunately they did not want especially old-fashioned, authentic recipes, nor had they to be only Swiss. The theme of the show was people passionate with cheese, so finally we filmed 7 of my favorite cheese dishes. On the film you can get a peek of my kitchen and some of the utensils I use. More about this in a followup article, including lots of behind the scenes pictures and the recipes not shown. The concept of the show is to ask a team of Japanese to cook one of the dishes seen in the video for people to taste on the set. These things are not left to improvisation so we discussed a lot and they flew back with enough cheese to cook 3 different recipes to keep their options open. From my limited grasp of Japanese culinary culture (still not so bad for a European) I thought that a kind of hyper-caloricious "Swiss Tempura" with deep fried cheese, could appeal to the producers who made the final choice of what recipes we would film and which one would eventually be cooked on the show. It is simple, very tasty, easy for viewers to understand how it might taste and very close to the ubiquitous japanese tempura. 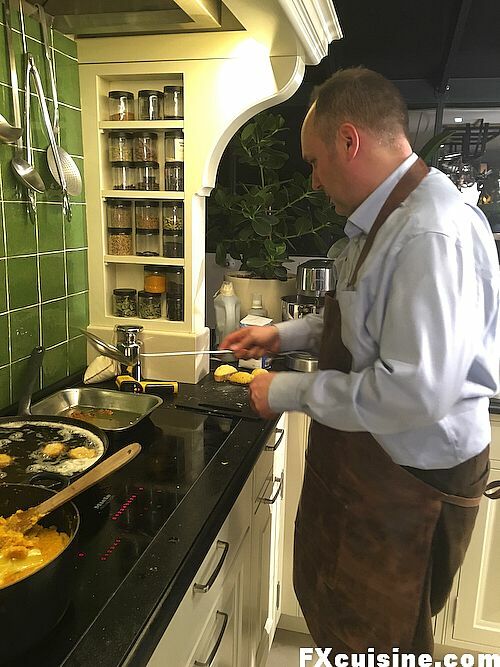 Before they came I tweaked my recipe to see if modernist research into improved deep-frying batter could help. I used a half cake flour, half rice flour recipe with a drop of honey for color, beer, baking powder and plum brandy. This was tested a few times before the TV crew arrived (my liver has yet to recover) to very good effect, a very crispy exterior with good color. You absolutely need to get the oil to 190C before you start. You can look up Heston Blumenthal in Search of Perfection on Fish and Chips for the science behind this. So finally out of the 7 recipes I cooked for them (including one soup from my garden's vegetables) this was the one they chose! On the film you can see George Tokoro taste a version that was cooked for him in Japan according to my recipe and the Gruyère we bought in Cave de la Printse. Seems like they liked it! Original article with the traditional batter here. This is my photo of our hero shot - one of 5 I had to serve until the cameraman Mr Nakamura was satisfied (I should mention he dutifully ate all the refused Malakoff before ordering the next one for "another shot please"!). Here is what the Japanese food stylers cooked back in Tokyo - it looks pretty legit to me! On the set George Tokoro tastes the Malakoff and says things like "Ah this is so good - I cannot stop eating. I want this to be the main course of every meal!". The titles say "Sweet and melting cheese, you will be addicted - Malakoff! Tokoro World Delivery : Swiss Cheese (higher resolution) "From Switzerland - 30 years of love for cheese - Ultimate cheese cuisine which even melts the King of Cheese". If you speak Japanese, can you tell me what the people on the set are saying, it appears to be very funny but I don't understand anything... Also if someone can tell me more about Mr Tokoro, they say he is famous in Japan but all we see here are his wikipedia page. A memorable fondue in an over-the-top dungeon chalet straight out of a Hammer film. Our host, Paul du Marchie, has been building an architectural fantasy in the middle of the woods for the last 50 years. Dont' miss my eight 360° panoramas! The national dish of Valais, my Swiss canton, raclette is the most gorgeous melted cheese you will ever have. Here at its best at the Manoir de Villa in Sierre. Make an extraordinary dessert in no time using stale bread an apple. A timeless classic from the Swiss Alps. Follow me as I wake up in the wee hours of the morning to see Swiss armailli make a unique cheese in a small chalet up the Gruyere Alps. How I bought cheese in a small cheese making chalet in the Swiss Alps 2 hours walk from the last road and how I turned it into a delicious Croûte au fromage. What a grand time shooting this show must have been, François! Congrats on a great job. Also, your new kitchen is absolutely beautiful. FX's answer→ Thanks Chris, yes it was good fun I guess, but 15 hours a day for 3 complete shooting days! I remember the Swiss article very well - not surprised it has been so popular worldwide! You must be a very energetic and adaptive person to be able to work on such a complex project at such short notice. Whew! And my word, the pictures of the "Swiss Tempura" made my mouth water at 9 AM. 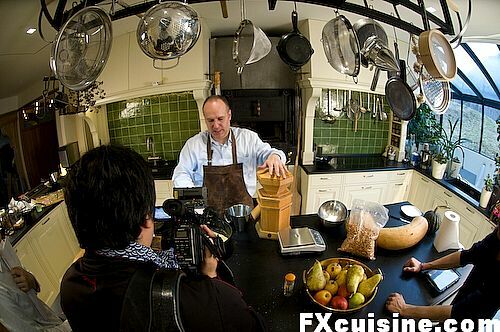 Hi FX, any chance we could see the footage of your Swiss Food Documentary? FX's answer→ Well I hope that sometimes you will - why are you interested? Does this mean you are back to blogging? Or have you been all along and I missed it? FX's answer→ Yes I have been back for a little while now, more articles are ready for publication soon! Great to have you making articles again, FX! Your website has been a favorite of mine for years. It had been years since I visited, because you had taken quite the break! But it is good to be able to once again read such quality articles about delicious food, so thank you! I haven't made many of your dishes, but the parpadelle with meat sauce was killer! Will be making the garlic soup soon. Anyway, thanks again and keep up the good work! part 3: Ok, here Fransua will teach us of his most tasty cheese food. Here is flour, eggs, vinegar and so on, baking in 190C oil (looks good), and it's ready! Now testing...it's hot! And tasty too! This melted cheese is so good! Now to another dish: markofu (?). FX: this dish is known since Napoleon wars. We cut cheese, add wine and honey, fry it in oil... How the taste? Wow, it's good! FX: here is my small gift fir you. Guy: oh, this real estate guy is amazing! He is really into cheese. This new cheese is tastless, but he become good with aging. Now let's try some cheese too! (man with a plate enters). He got camera there (hahaha). It's tasty (haha).And also sweet (from honey). Cool. I want to eat this forever (hahaha). This guy's face funny (haha). Now markofu (?) recipe (follows). FX's answer→ Thanks a lot! Markofu must be Japanese for Malakoff! Great article, beautiful kitchen! But...where's your always-present-in-the-past pink shirt?? I liked it! FX's answer→ Thanks a lot Louise, yes the kitchen took me quite a while to get right and it is not even completely finished yet! Hey Francois, so happy to see that you're back to blogging. I have enjoyed many hours reading your articles and looking at your fantastic pictures. FX's answer→ Thanks Cam, lots of new articles are in preparation! Ah, Franswa-san, they did reveal your age! Hehe. I don't speak Japanese but it's really exciting to watch the program. The picture, setting and facial expression speak for themselves. 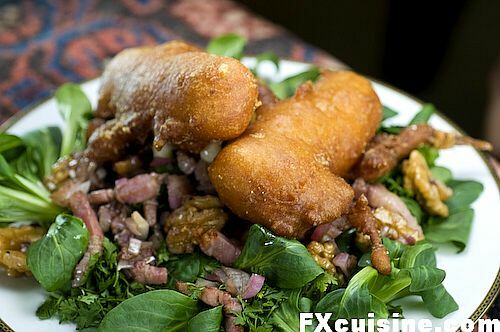 It's good to have back regular dose of FXCuisine goodness. Keep it up! FX's answer→ Hazri-san, have you considered that maybe I lied on the application form and used flour to lighten my hair color, so that I may appear older and therefore more respectable to Japanese foodies? so nice to see this video made for a Japanese public. I might even think that there could be some interest in the USA, doing a video with one of the famous TV chefs. The challenge that I see is the temperature of the gooey melting core of the mini cheese slab and sensitivity of the tongue and inner cheek of the person trying to enjoy it. In a fondue or raclette you know what is coming, but biting into the Malakoff brings an unknown temperature, which you may not expect. That requires some superb timing. That it will taste extraordinarily well goes without saying. FX's answer→ Good idea! Which US TV chefs do this type of foreign reporting? for a translation of the Japanese spoken in this video, I guess you can get some help from within the big Y-shaped building in Vevey on Lake Geneva. Good to hear from you again. It has been quite a while. Francois-san, what a delightful video. Congratulations on acquiring a Japanese fan club. One doesn't need to speak Japanese to appreciate this video- the images of your fans' joy (not to mention the sensuality of the images of all that delicious cheese…) makes for entertaining viewing! I am so envious of your in-house cooking facilities ^_^ mercy beaucoup! Great to see you are back. Have always enjoyed your work. This new episode is wonderful! FX's answer→ Thanks for visiting again! The Japanese viewers probably saw the same enthusiasm and passion for food (or cheese in this case), that attracts so many of us. Congratulations on being recognized cross borders! FX's answer→ Ah yes I think they were quite happy with their Swiss expedition ... Thanks a lot for you support! I think I was as delighted as the Japanese journalist ohing and ahing... as I got a rare glimpse of the rest of your house and your impressive gear! What a treat! That's so cool! However, Japanese TV is really really CRAZY and so unusual to what we're use to! That a big part of the fun as well though! FX's answer→ Indeed I could not believe the voice-over, actually it's the same lady you see in the video but she places her voice 1 or 2 octave higher than natural when recording the comments. In the car when I spoke the Japanese in the back made all sort of phatic sounds, usual in Japanese, like eeeeeeehh. This sounds very funny to us! Haha! So happy for you - this is what you deserve and more! Your blog is one of the few that make me chuckle and laugh out loud with its authentic and down-to-earth humour. Hope you become more and more well known in this world that needs more authenticity and infectious passion. FX's answer→ Thanks! Yes life is nicer when we find the funny side of everything, isnt'it? This is too cool for words! So happy for you! FX's answer→ Thanks a lot Cynthia!